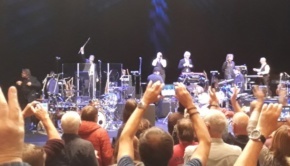 This will only be a short piece, as my esteemed colleague Jez Rowden has already said all there is to say on the emotional and musical impact of this revered combo in his review of the Cardiff gig. 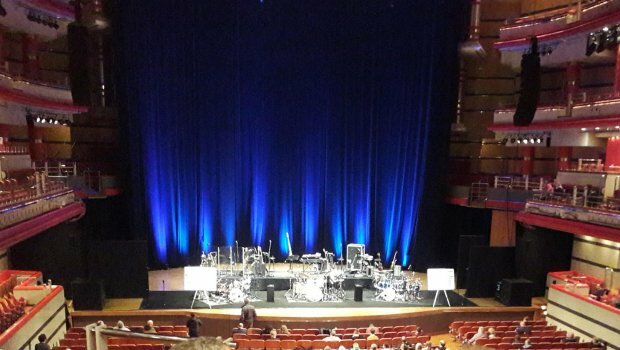 In The Court Of The Crimson King is 50 years old next year, and the true instigators of this nonsense called “prog”, the mighty 16-Legged Groove Machine, aka King Crimson, show them all how it’s done on their current endless revue, the latest instalment of which Phil W and I caught in the splendid surroundings of Birmingham Symphony Hall on Tuesday night last week. 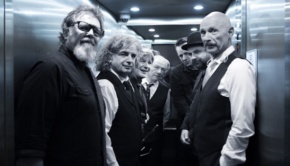 Unlike the vast majority of fellow survivors from the original era of progressive rock, when the descriptor simply meant what it said on the tin, treading the boards in the 21st Century for King Crimson has very little, if anything, to do with nostalgia, oh no. What Crim do is reinvention. They re-make and re-model where lesser bands turn in hopefully note-for-note carbon copies of their classic tunes. One such example was Easy Money, a tune done to death on those gargantuan wallet-rinsing box sets centred on old albums that Crim have cornered a lucrative market in (OK, I’ll give you that IS nostalgia, but they do it so well!). 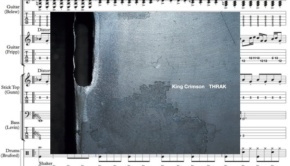 Tonight, the Fripp/Wetton lumpen white boy funk becomes an open and spacious loose-limbed skank that eventually disappears down though a wormhole left somewhere in TLev’s taut bass line, and morphs into spacerock of the most atypical kind, before being pulled back up by Jakko’s howls into the void. Simply stunning, and one of a few moments where this grizzled old buzzard almost blubbed… almost, I say, dignity was retained, but it was a close call! Everyone (apart from Jez it seems 🙂 ) knew that the centrepiece of this tour was to be a rekindled Lizard suite, a piece rarely (if ever?) played in its entirety at the time it was written, well over 45 years ago. Fripp has obviously got past his well-known dissatisfaction with the original recording, and it now resembles a classical fairy tale set to music, and another “lump in throat” moment hit yours truly. Stunning stuff! 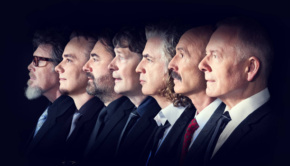 Cirkus goes into Mellotron overload, as Bill Rieflin, Jeremy Stacey, and Fripp all hit the keys to create a swirl of dervishes on the pandemonium seesaw. A word about Mr Stacey. What a find he is! The middle man in the three drummer line-up, he contributes to the thunderous syncopations and polyrhythms, taking his cue from Ring Leader Gavin, but where he really shines is with his electric piano contributions, taking on Keith Tippett’s role on Lizard with an accomplished ease. Moonchild is another “new” addition to the setlist, and while the song part played out beautifully, I was intrigued as to how the noodling on the the album version would be approached. And, yes it is noodling. ITCOTCK might be a pivotal and highly influential album, but even I will admit it is not perfect. I need not have worried, as short but powerful bass highlights from an ever-sprightly Levin, and Jeremy’s piano improvs took it over the bridge into the title track of the album in question. After the customary lighting change to red all over during Starless, always a thrillingly schizophrenic number to finish with, the house roars its approval as one after a truly joyful concert. Those who consider Fripp and Co. as dry and soulless simply do not understand and it’s their loss. I have to admit I was undecided for all of five minutes as to whether I wanted to see the 21st Century Crim for a third time, but boy, am I glad I did. This band put all their contemporaries and plenty of much younger bands swimming in the prog pond to shame with their sheer musicality and professionalism. Roll on next time!